After breakfast, enjoy a half day walking tour of Rome. Travel into the beating heart of Rome and visit four of the most famous piazzas not just in the city but in the whole world. Explore and admire awe-inspiring St Peter’s Square, the atmospheric Piazza Navona, the elegant Piazza della Rotonda with the Pantheon and the spellbiding Piazza di Trevi, which is where the famous fountain is located. Throw a coin into the water and your wish of returning to Rome should come true!. In the afternoon, time at leisure. Overnight in Rome. Day at leisure. 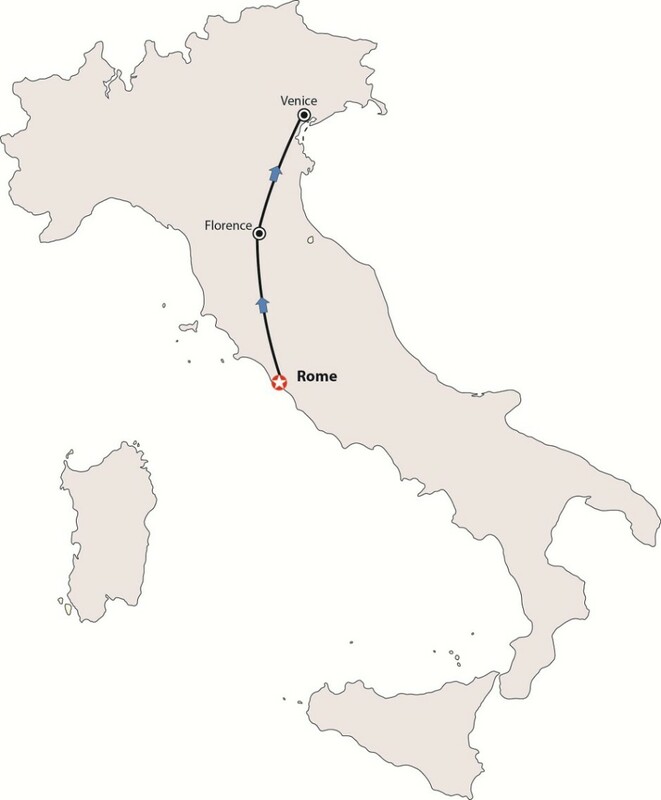 Continue exploring Rome or we suggest taking an optional ($) half-day excursion to Colloseum or Vatican. Overnight in Rome. After breakfast, we suggest taking an optional ($) guided sightseeing tour of Florence – the cradle of the Renaissance – during the optional tour you will see the beautiful Piazza del Duomo, the Cathedral of Santa Maria del Fiore, Giotto’s Bell Tower, the Baptistery of St. John, and the Academy of Fine Arts Gallery housing the “David” by Michelangelo. Rest of the day at leisure for optional sightseeing or shopping. Overnight in Florence. Breakfast at the hotel. Day at leisure to discover Venice on your own or we suggest taking an optional ($) morning guided walking tour of this unique city or a half day tour to Murano & Burano. Overnight in Venice.